Located right behind the Art Gallery of Ontario and west of OCAD University, Grange Park fronts onto Beverly Street. The picturesque green space in downtown Toronto has had a long history in the city, as it was once part of the Grange estate built by the Boulton family in 1817. In 1910, the estate and two-hectares of land was bequeathed to the Art Gallery of Ontario to build an art museum and in 1911 the gallery entered an agreement with the city to keep the land south of Grange house as a public park. The Grange Park was revitalized with the aim to create a new exemplary green space within the city core. The park was refreshed with a large state-of the-art children’s’ playground displaying structures resembling art studio tools and supplies. Other amenities include an off-leash dog area, new greenery featuring a variety of local tree species, outdoor seating and an interactive water feature. Grange Park is also now the home of the famous bronze sculpture by Henry Moore, Large Two Forms, and the centrepiece to the park walkways. Designed by Vancouver based landscape architecture firm, PFS Studio, the prestigious park wove together all of its feature elements with a series of new walking pathways. 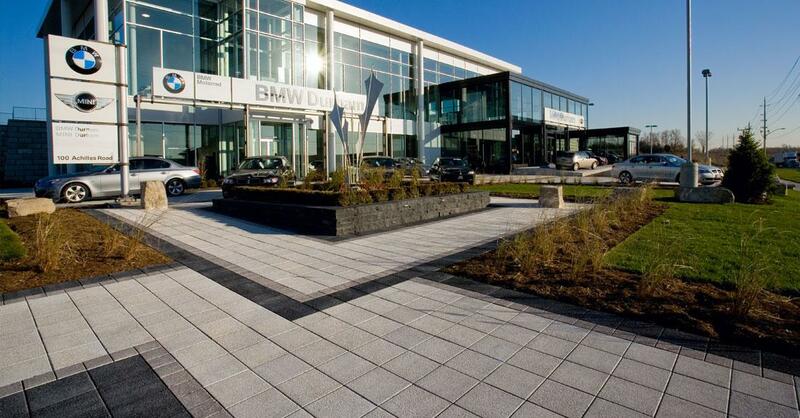 Unilock pavers with SeriesTM finish in Ice Grey and special order size at 150x300x100mm (6×12 inch, 10cm) were used for their high-performance granite and quartz surface materials, acting as heavy duty to ensure taking the load of service vehicles and withstanding high pedestrian traffic. Fourteen inscribed paving stones are laid in the south path with quotations that relate to nature or the diversity of community. The park re-opened in summer 2017 immediately drawing crowds of people gathered to see the rejuvenated green space. A welcoming and accessible place for all, it is now a city staple and beloved spot for OCADU students, dog owners, visitors and local families to relax and engage in fun outdoor activities. Toronto’s Grange Park sets the bar high for the new generation of public urban spaces. It is “a new model for how parks should be built and operated”, said Councillor Jow Cressy.